Welcome to this, the second in the culture vulture series. If you want to look at last month's you will find that here, but what culture have I been absorbing this month? Back in July, Muriel of French Yummy Mummy got in touch and offered to send me a copy of her book, which obviously, being a reader of her blog and a lover of books, I accepted. This month, I finally got around to reading it, and I'm so glad I did. It's a light-hearted and amusing look at life in Britain from the perspective of someone who has moved here from another country, and I have to say as I devoured the short and snappy chapter of this book on the train, I found myself laughing out loud. More than anything it was because the witty observations were things that, as a born and raised Brit, I totally related to. Everything from our random NHS system, through to our even more random little sayings and the fact that we like to talk about the weather. Each topic was handled in an amusing way, and it was evident from the writing that Muriel has quite a fondness for this crazy little Isle. I would definitely recommend reading this if you want a light-hearted chuckle, and a great book that can be picked up for short bursts of reading. I can't make my mind up about this book. It's a health and beauty book, and whilst it did have some useful tips in, a fair bit of it felt a bit like new money for old rope. If one thing stood out for me that I did like about the book, it was the tips on how to reconnect with your own body, and the areas where it touched on Ayurveda. There's no denying that Kate Hudson looks fantastic, but I think that's more down to her discipline in following the lifestyle that she discusses in this book. If you are really looking for some ideas on how to reconnect, time out for your body and mind, diet, exercise etc then this will probably be a nice book for you. If you already know a fair bit about what you should be doing, then I don't think you are going to learn anything new from this one. I approached this film with some trepidation. I am a lifelong fan of the Ghostbusters franchise. I used to watch the original cartoon on the TV every week as a child, and revelled in getting to the pictures to see the original Dan Ackroyd/ Bill Murray spectaculars, so when I heard about a new Ghostbusters, with an all female cast I questioned, was it going to be a disappointment? I'm so pleased to say, it wasn't. I truly enjoyed this film so very much that when it comes out on DVD I will be buying it. It was hilarious, as I would expect it to be with Melissa McCarthy in anyway, and the original characters came through in each of the actors in role. There were also some fabulous cameo appearances from Bill Murray, Slimer (of course), Janine the receptionist and even Sigourney Weaver (If you've not seen the originals then you will have no idea about these cameos). I would say, whether you are an original Ghostbusters fan or not, then this film is well worth seeing. It's no secret that I LOVE the Simply Luxurious Life blog. It's amazing, the writing is fantastic, the pictures are great and, there's just nothing about it I don't like. It's no surprise then that I would have one of Shannon Ables' blog posts as one of my featured favourites, and this one was the one. I'm not going to spoil it, the title is pretty self explanatory, so if you are looking for some hints and tips on productivity then head on over now and read the blog post. Having only lived in Scarborough for a relatively short space of time, I’m still very much exploring and discovering the area. Right back at the start of Spring I was researching some places that the Mr. and I could visit; places where we could go walking, or for a picnic, when I stumbled upon this walk at a place called Hayburn Wyke. 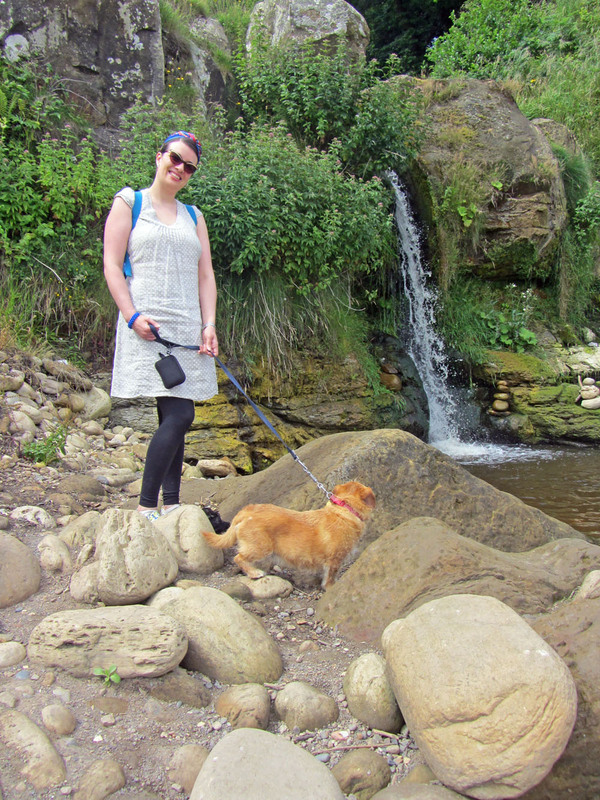 Inviting walkers to discover a hidden beach with its’ own waterfall, well how could I resist. That was months ago, and in the interim we’ve found every excuse from bad weather to pure laziness not to go. Back in July, we finally got into action and got there. It’s not too far from us, just beyond a village called Cloughton, on the way to Whitby. 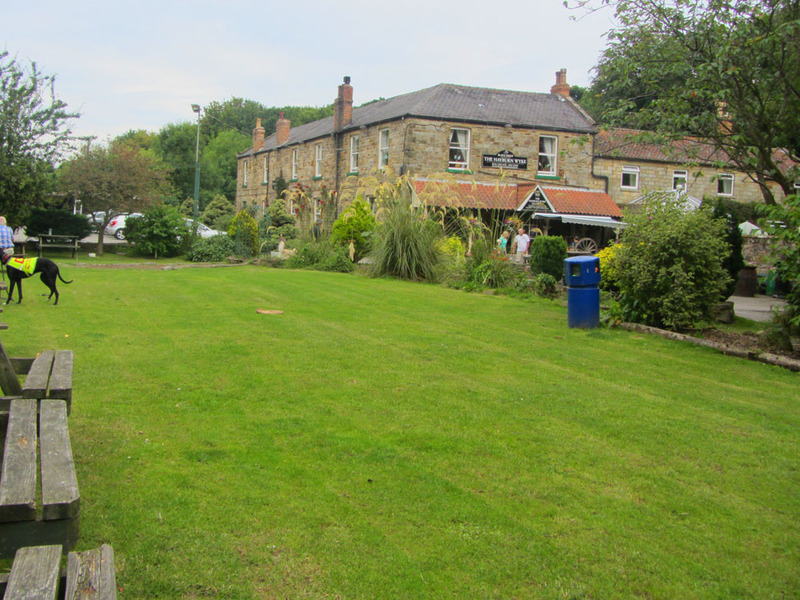 We arrived around lunchtime and parked up at the stunning country pub, aptly named the Hayburn Wyke. 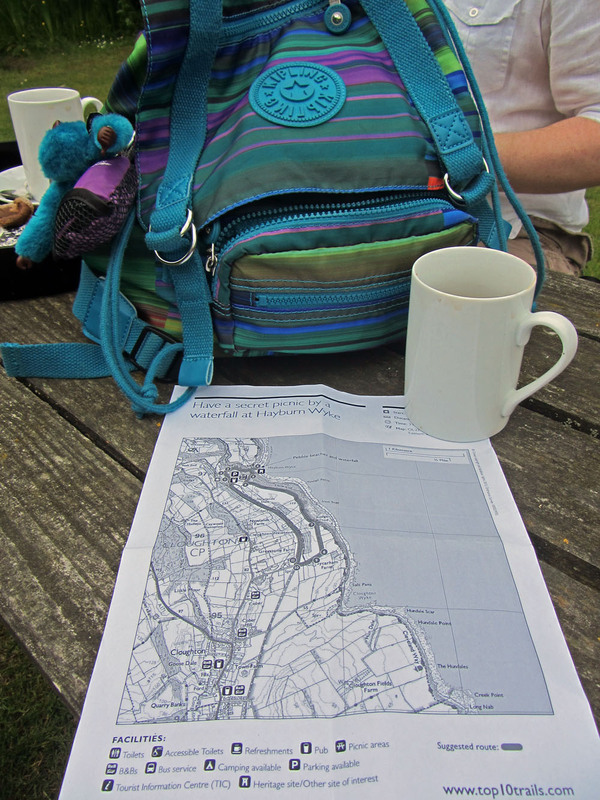 It was a pleasant day so we enjoyed a cup of tea in the spacious garden before embarking on our walk. We set off through fields and off into beautiful canopied woodland. I wasn’t that far in when I started to regret my decision not to wear hiking boots since the ground was uneven and my ankles weren’t getting any support from the canvas pumps I had opted for. Rookie mistake. 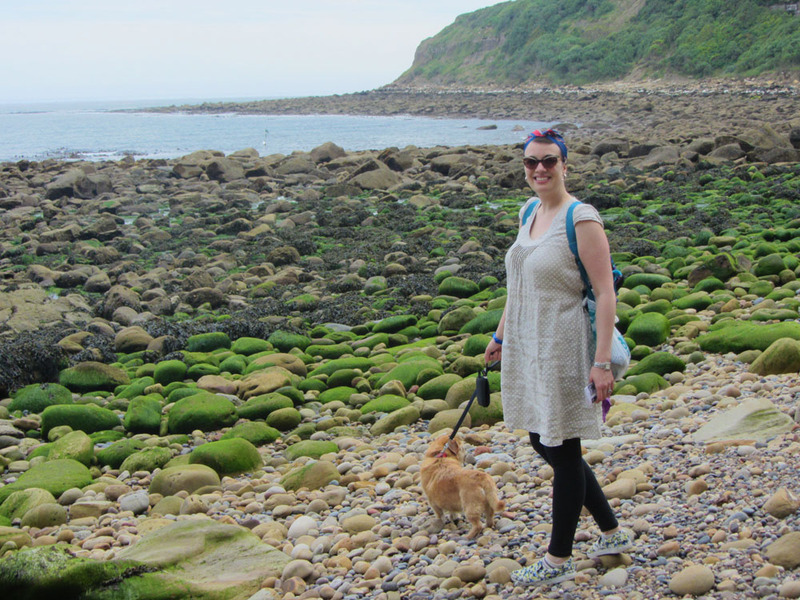 Having followed the route downhill, we soon arrived at the rocky pebble beach that is Hayburn Wyke, and enjoyed all of about 5 minutes solitude before a family arrived on the beach too, c’est la vie. 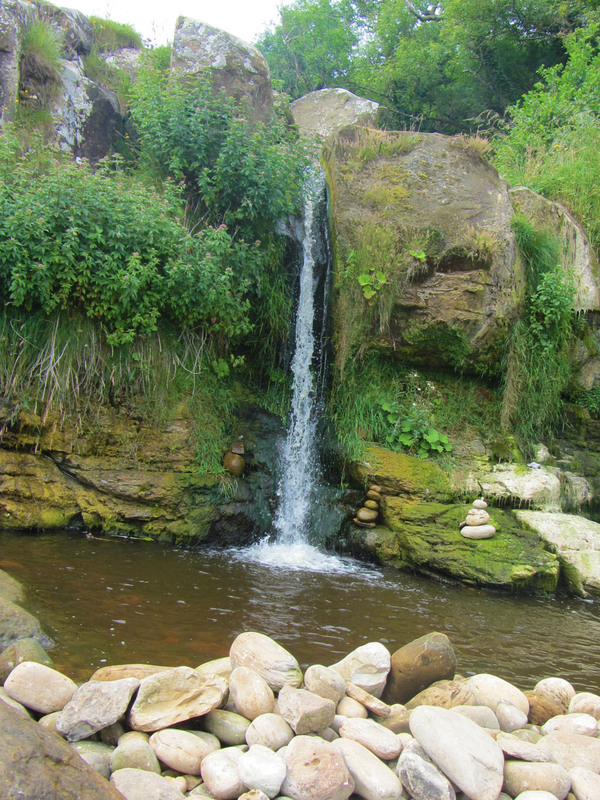 The little pool that the waterfall tumbles into looked very inviting, and before long I found myself paddling around in the copper tinged cooling water. Actually, I quite regretted having not brought a swimsuit since this would have been the perfect spot for a little bit of a wild swim (a very small wild swim since the pool itself isn’t huge). If I get back there again on a good day before the end of summer then I will definitely bring the costume. We admired the wild ocean, but having worn the wrong footwear, we couldn’t really do too much exploring before we set off back up into the woodland. 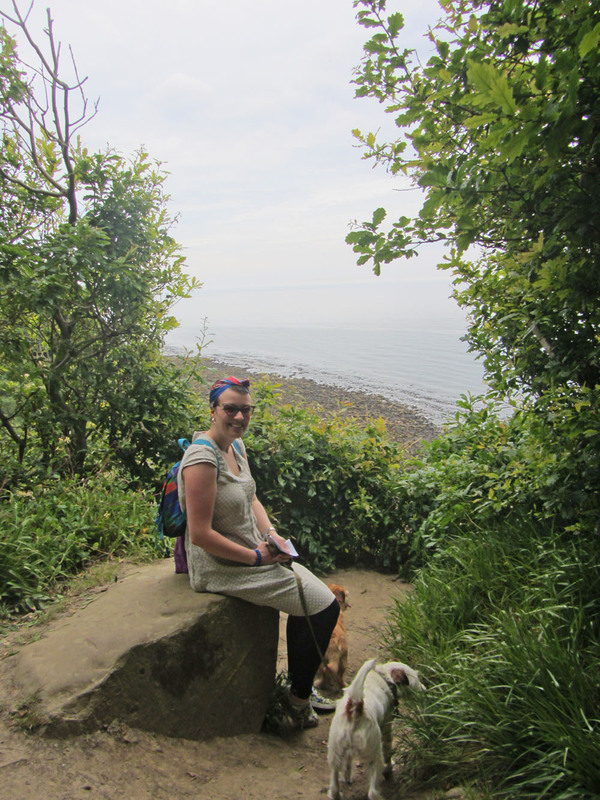 It was a humid day and the upward climb along the well-trodden Cleveland way route had me sweating and out of puff. That’s more a mark of my own lack of fitness than the difficulty of the route, I would say. 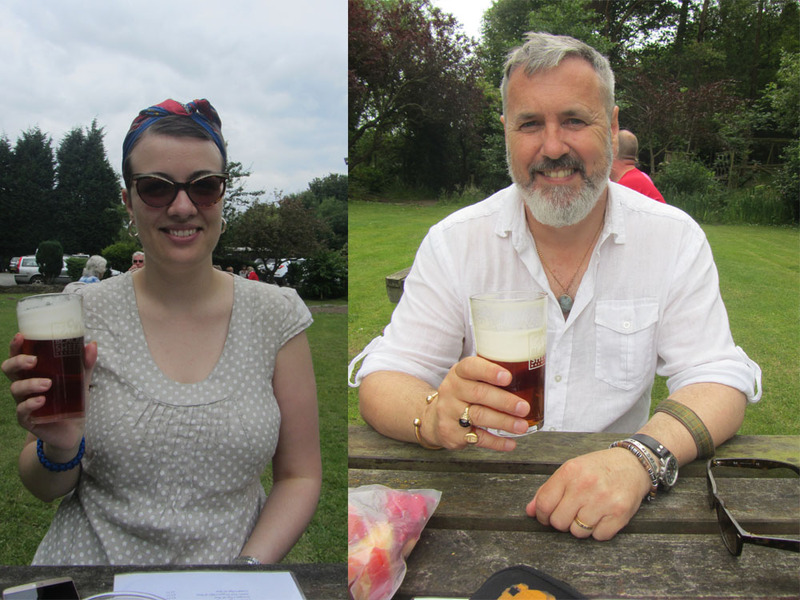 After a total of about 2 hours, including our time on the beach, we found ourselves back at the pub enjoying a well-deserved cooling pint of Black Sheep beer. It was the perfect way to spend a Sunday afternoon, and now that I know it’s there I will definitely be back again! It's fair to say that when it comes to outdoor concerts and spectacular events, Yorkshire has it nailed. I don't think I had been to so many outdoor concerts before living in Yorkshire, but ever since I've been to many, from pop concerts in the woods, to classical extravaganzas under a magical night sky. 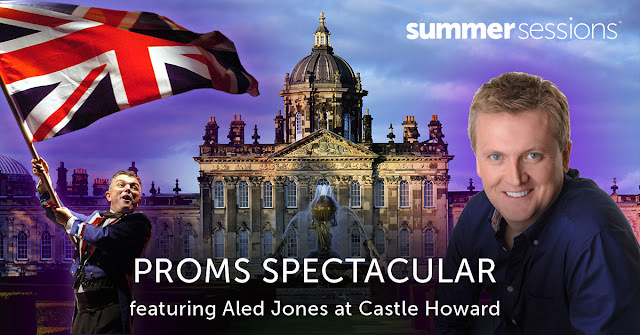 The Proms Spectacular at Castle Howard on August 20th is exactly one of those classical extravaganzas, and with classical stars including vocalist Aled Jones MBE, conductor Jae Alexander and the English National Orchestra, this is going to be a wonderful experience. 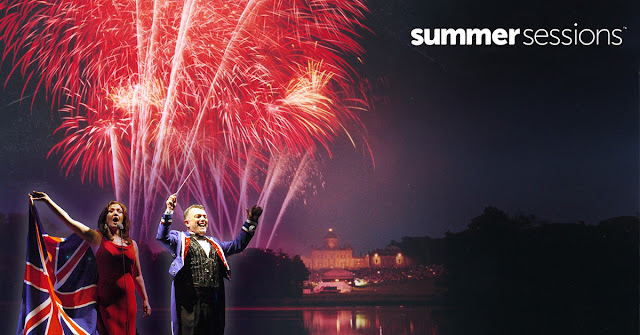 I do love a classical music concert, and a proms night is a special treat. Picture the scene, the breathtaking grounds of 17th century Castle Howard in picturesque North Yorkshire beneath the gaze of the Howardian hills, a perfect spot on the ground for your picnic basket overflowing with beautiful food and of course a glass of Champers (or Prosecco if you prefer), as you wait for a sensory treat of breathtaking classical music, topped off with a truly stunning firework display. If that doesn't sound like a perfect addition to anyone's summertime, then I'm not sure what does. Time to treat yourself to this fabulous experience. I have been given a discount code on tickets to this event for my followers. 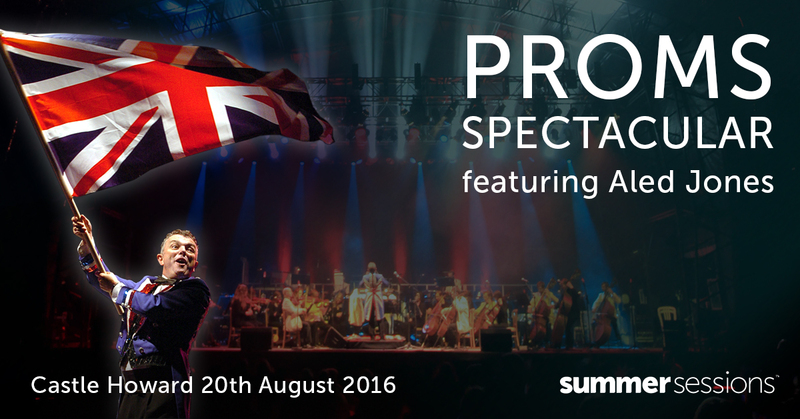 So, head on over now to the Ticketline website and use the discount code PROMS20 for 20% off the price of your tickets for the event and if you want to read more about it then you can here. I'm also pleased to be hosting my first ever giveaway on the blog, which is very exciting. I have two tickets to giveaway to the event, to take place on Saturday 20th August. If you would like a chance to win this amazing prize then please enter using the Rafflecopter giveaway form below. Good Luck. 2. Winners will be notified via the contact details they have provided as soon as possible following the draw end. Two electronic tickets will be provided to the winners via email. If I am unable to contact you then I will be unable to provide the tickets in time so please ensure that I have your correct information. 3. No transport or food costs are included in the prize, this is the responsibility of the winner.